27th November 2012 - First published by Tim Pellatt of Cordial AV in Hungry Eye Magazine in October 2011. A whisper is not a shout with the volume turned down! Sound design is no longer the realm of feature films alone; although these provide the best example of the art. It can be found in everything from TV programmes to corporate videos, in one form or another. Every ‘whoosh’ accompanying a lower third, the choice of music, the way all elements of sound are mixed to form one flowing soundtrack; all come together to increase the viewing experience. So, what’s sound design all about? The short (but still long) answer is that it is a way of immersing an audience in an environment associated with the narrative of a performance or visual. Though, very often, audiences still have to sit through films that are doused in aural mediocrity, I’m sure that if you think about it, you can come up with examples of films that look fantastic but lack something. That something is very often effective sound design. The original film world meaning of the term ‘sound design’ was established by Francis Ford Coppola and Walter Murch (the man ultimately responsible for all aspects of a film’s audio track, from the dialogue and sound effects recording to the re-recording of the final track). The title was first granted by Coppola to Murch for his work on the film Apocalypse Now in 1979, in recognition of his extraordinary contribution to the film. Incidentally, Apocalypse Now was the first multi-channel film to be mixed using a computerised sound desk. Coppola first recognised the incredible contribution sound design had to make to the film industry in 1972, when he directed a live production of Noël Coward’s Private Lives at the American Conservatory Theater in San Francisco, where ‘sound designer’ Charlie Richmond was working with Murch on the final cut of The Godfather. Approaches to sound design can differ greatly. Depending on the film and how the sound is intended to make the viewer feel and interpret the scene, it can be subtle: a soundscape full of natural-sounding stereo audio. It can also be more abstract: sounds used to create emotional realism, to build tension or demonstrate a state of mind. Comprehension through sound alone can be hugely powerful. For a good example of this, envisage if you will a wide shot of a girl sitting on a park bench with a man walking up behind her. If both characters have neutral facial expressions, without any form of soundtrack there is no emotional reference upon which to gauge the scene. Now imagine the same shot with a dark, droning soundtrack that is gradually building in intensity. You now know that the man’s intentions are sinister and the girl in imminent danger. Replace the ominous-sounding drone with the distant chimes of an ice cream van and the sound of birdsong. Instantly the same scene takes on a whole different mood. Emotional realism is telling you how to feel; not by accident, but because the sound is designed that way. Mix with score and you have a scene with something to say. In most cases the sound designer will have been involved during the early stages of film production. In feature films, sound is not something that is tagged on in post-production, but considered an integral part of the film; the feel planned from the start with the rest of the production design process. A quick look at the IMDb sound department credits on any feature film shows that on most productions there is a huge team responsible for sound design. 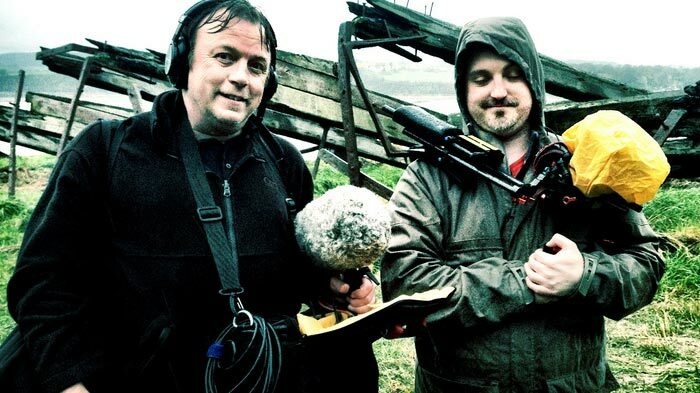 Unfortunately we don’t always have the luxury of a fully-crewed sound department, but there’s still no excuse. The easiest way to reduce the viewer’s involvement in an otherwise fantastic film is poor sound. So on to the technicalities. You need to ensure that you can acquire the basic building blocks in the form of any dialogue or sounds relevant to the scene. This needs to be as clean as humanly possible, avoiding unwanted background noise. Just remember, with a directional mic, what you are rejecting is as important as what you are capturing. By pointing the mic away from the most distracting, unwanted background noise, you are able to improve the recorded sound; even if by a small margin, it’s still an improvement. When recording sync sound you should aim to get your mic as close to the edge of the frame as you can. If it’s not sync sound, you have the luxury of not having to worry about the camera and can concentrate on getting the best sound possible. Don’t forget that sometimes ‘room sound’ is a good thing. If it’s recorded in the same location as the images and dialogue, the ambiance should be the same. Exercise caution though: if it goes wrong you have little chance of fixing it in post. Very often a dry, close-mic recording of everyday sounds, when listened to in isolation, sounds hyper-real. However, when settled into a mix it sounds great. Ambience, or room tone, should also be recorded for a couple of minutes. By this I mean the sound of the room or location you are in. No location is silent – there is always some sound – and a couple of minutes can be used to join dialogue, or fill gaps. Absolute silence stands out like a sore thumb. Any sound recordist worth their salt will always record room tone or ambience. Sometimes the low-tech approach works best. I once needed to record the sound of a television programme as a device to make the viewer feel as though something (or someone) was getting closer to the subject. The shots were cycling: subject, kitchen, front door; subject, kitchen, front door. I spent a couple of hours with the dry sound of the made-up TV show, trying to make it sound as if it was in the same room as the camera. All the shots were doing a creeping zoom, so once again, the sound in each room needed to follow the action, getting louder and louder. For me, no matter what I did with EQ, delay, reverb and dynamics, it felt less and less convincing. The solution? I put the soundtrack on a DVD, took it home, played it back through the TV and recorded it in the living room, the hall and the kitchen. I’m still not sure whether or not it was purely the fact that I knew it was authentic sound that made me happy with it. Which brings me to the title of this feature. Sounds obvious I know, but well worth bearing in mind: a whisper is not a shout turned down. As with everything, it still comes down to performance and getting it right at the acquisition stage. Unless you and your talent are experienced at ADR (automated dialogue replacement), then you’d best get the dialogue nailed with the pictures. I don’t want to talk about equipment in this issue; I want to take a more general view on the principles of sound acquisition and design. However, there’s just one thing that I think it’s really important to mention equipment-wise, and that is that the technology available to record sound these days doesn’t have to be hugely expensive, or huge in size for that matter. I’m sure that most of you have seen the self-contained, digital audio recorders that are now available. For the cost they provide fantastic value, and are capable of superb sonic quality. I have a digital audio recorder permanently in my HDSLR kit bag, and it’s been a useful device on many occasions. While the technology is available, compact and inexpensive, it’s inexcusable to not use it to your advantage. Music is probably the most notable element of any soundtrack. Also, in my experience, it is the most difficult, yet rewarding, sound decision. If you are fortunate enough to have the budget to have the score written and recorded, then the most important thing is to form a good relationship with the composer. It is essential that he or she fully understands how you want the film to feel before the process begins. If you are using stock music it can still take days to find the soundtrack that you think feels right. On this note, the words ‘stock music’ needn’t fill you with dread. A lot has changed since the generic, unemotive, electronic dirge of the past. Good-quality stock music, played by real musicians, is readily available online at reasonable cost. I use Audio Network for lots of productions; its licensing rates are understandable and its music tracks excellent. When it comes to sound effects, if recording your own is not an option then these are also easily available online, listed in great detail. If nothing else, they are great to lay down to allow you to decide what you need to record yourself. Obviously great music, well-recorded sound and dialogue are useless if you are unable to hear the mix properly. I’m not going to advise anyone spend money on monitor speakers for the sake of it, but it is important to have at least a reasonable listening environment in which to mix anything with a degree of accuracy. Another point of note here is to explain why the final mix process is called a mixdown; because the natural tendency is to mix up. If we want a sonic element to sound higher in the mix, we naturally turn it up. This, of course, is the wrong approach. Perceived loudness can also be achieved by turning everything else down to achieve the perfect balance. As with everything in filmmaking, it is always advisable to hire a professional on a no-fail, important project. With sound this is especially true, as it is such an important part of the process. Recording and mixing sound is easily as creative as any other element of filmmaking, but it has a lot of technology, experience and expertise behind it. This shouldn’t stop anyone from experimenting with sound themselves; especially on personal projects. The understanding of comprehension through sound you will gain will prove invaluable.